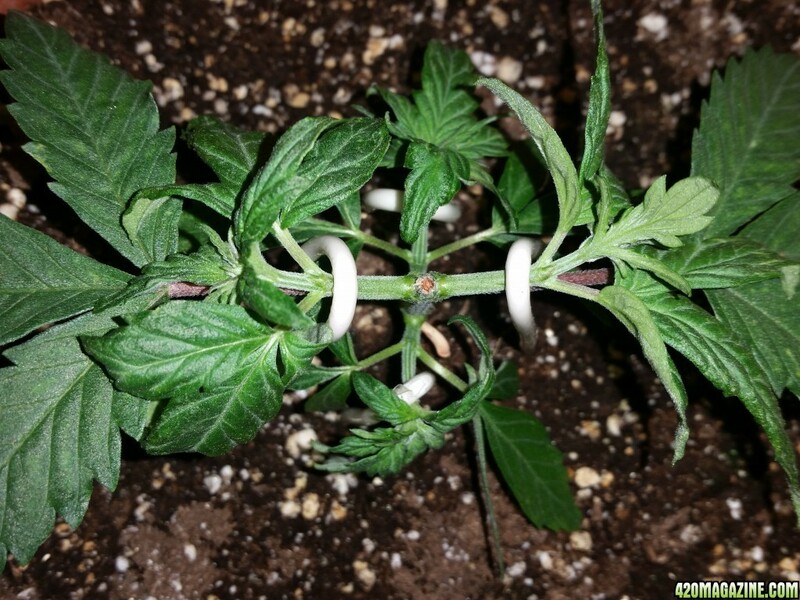 In addition to simply low stress training a plant from the start you can also create multiple tops. These additional tops can then be trained in the same fashion as only Lst'ing. First off there's the topping. This is where you will be cutting the stem above a selected node. For photoperiods it's advisable to wait until you have 4 or 5 nodes and then cut above the 3rd. Make sure to sterilize your cutting instrument first, number one rule. 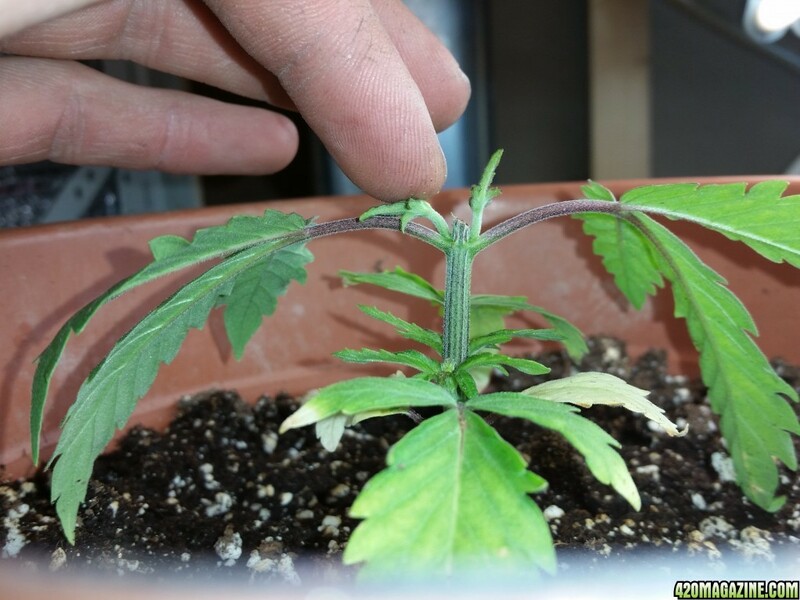 Next determine where you'll be "topping" the stem. Let's get a look at what I'm talking about. 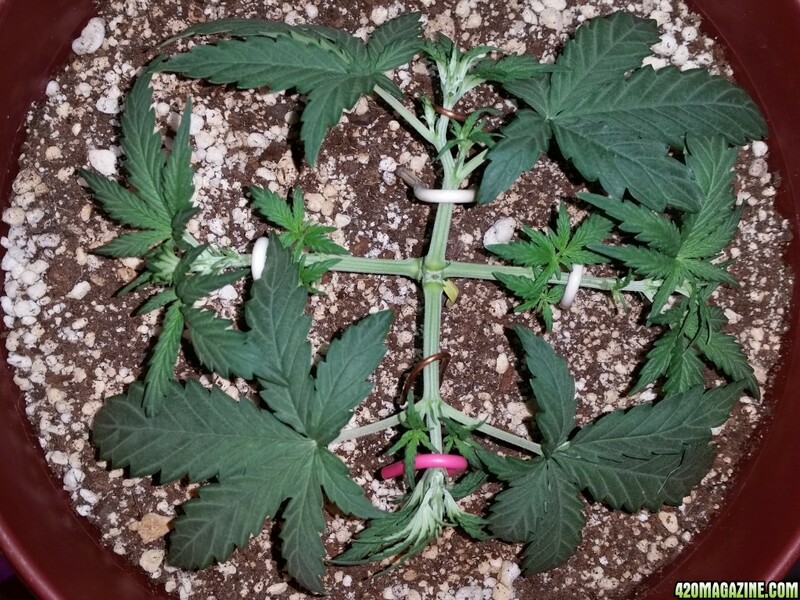 As you can see I've got 5 established nodes, including the first leafstems. 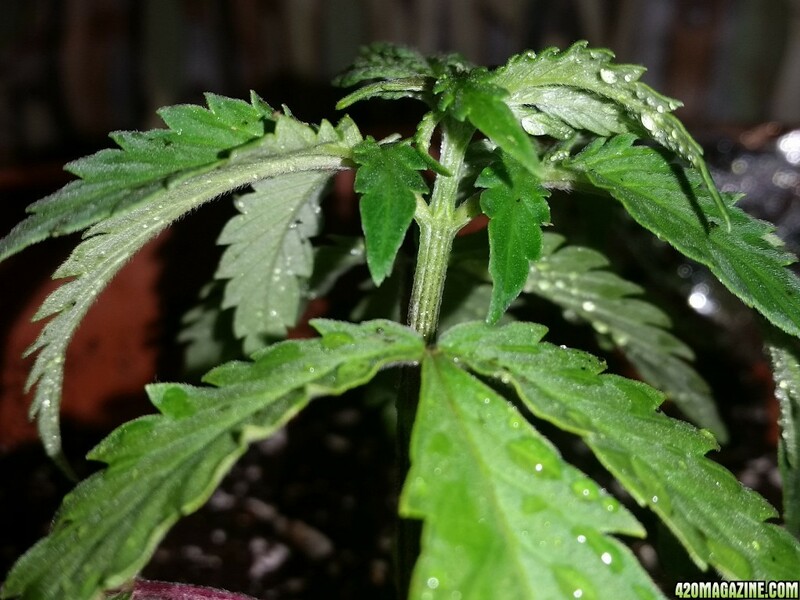 This particular plant is starting to lean already above the 3rd node. 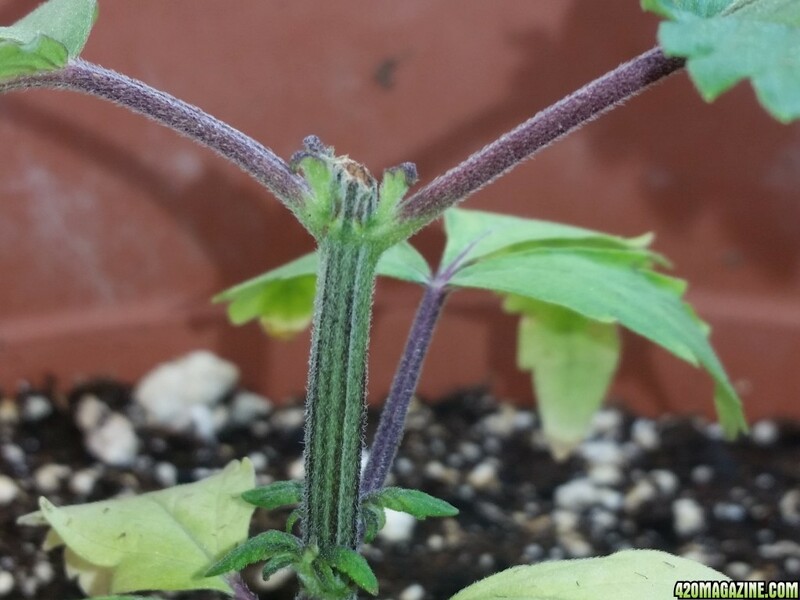 Here's the cut stem of plant. Notice the 45Â° angle I cut at. This is to prevent water or dirt or whatever, from sitting on the wound. It helps the water slip off and not pool. You can see the little tiny nubs that will become your new main stems. They will grow fast since they are still the pinnacle of your plant. In a few days they will have emerged. This is the remaining portion of the stem. 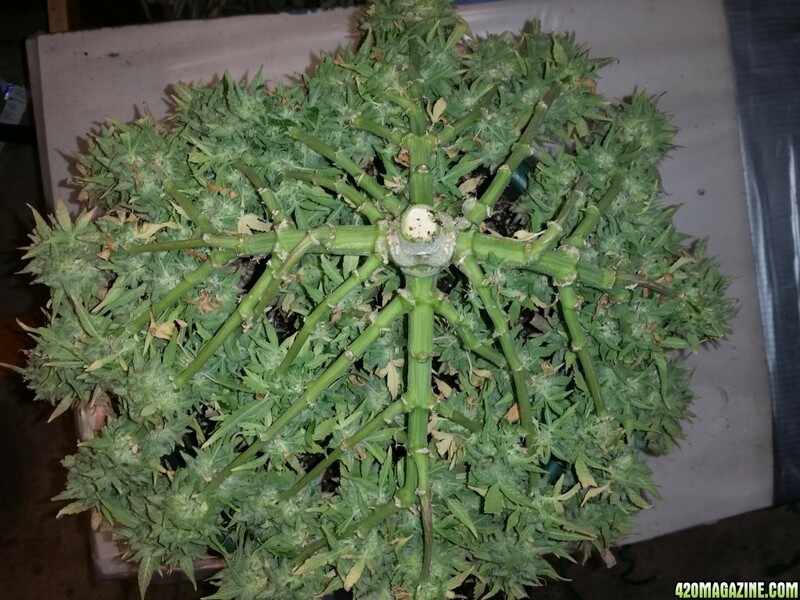 What you could do is wait until you have 6 or 7 nodes and then top the plant. 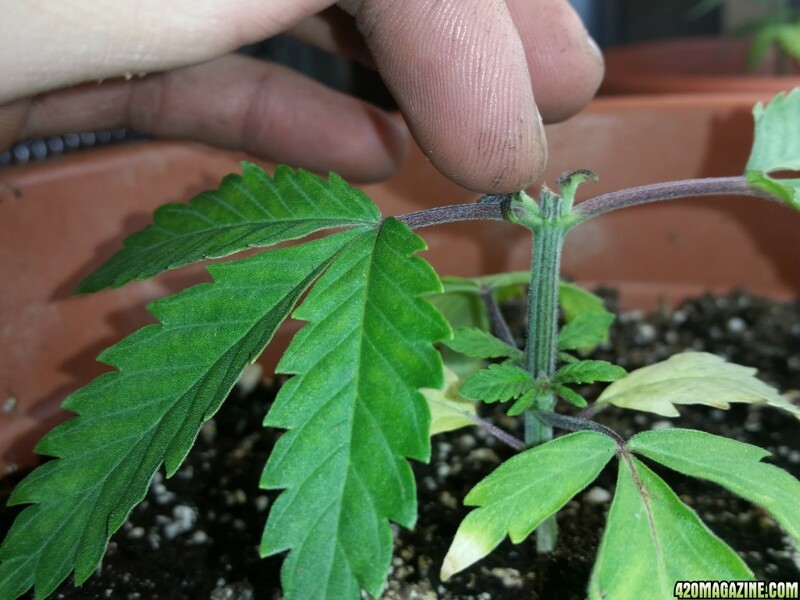 In this way you could trim the cut stalk and attempt to clone it. I'm not doing this for these test plants but it is very feasible for one to do so. 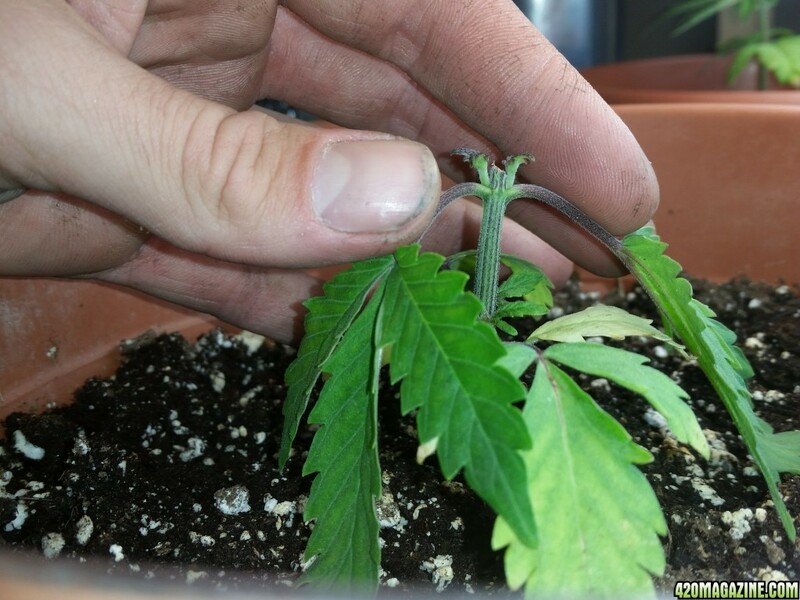 Now that's it's been a couple days and the auxins have been readjusted to incorporate two top stem. 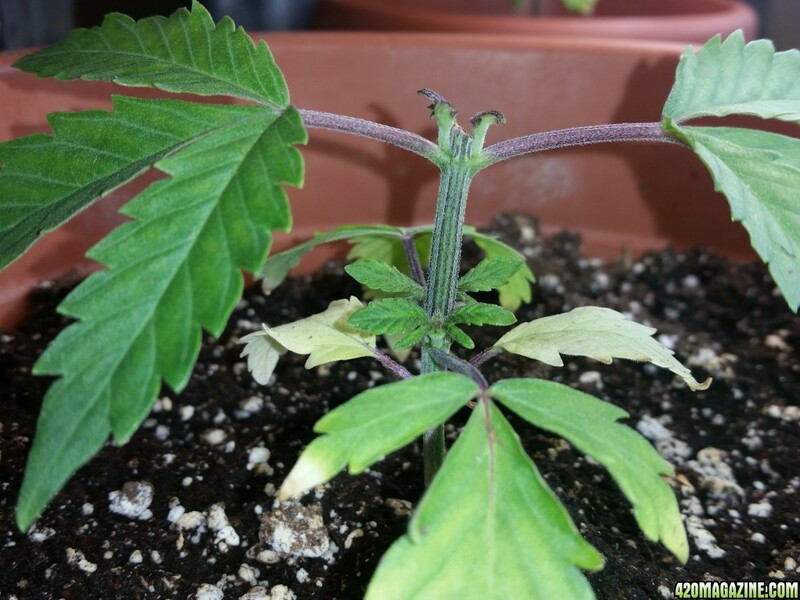 We can see that both lower nodes are growing and the top two shoots are starting their engines getting warmed up for the race. And a couple days later.. Let's start the daily Jedi training. I'll bend the leaf stems away from the mainstem. Making a bid "M" shape. This gives (imo) the new shoots more room to grow freely. Disclaimer : if you think you're going to break it, don't do this step... For steady hands only. Next I'll super gently bend the growth shoot down to meet the leaf stem. Use very little pressure as to not break it, it is very delicate at this point. And then repeat, for a few days. This is going to make your new stems stronger and become more or less oriented in the direction you'll be training it. 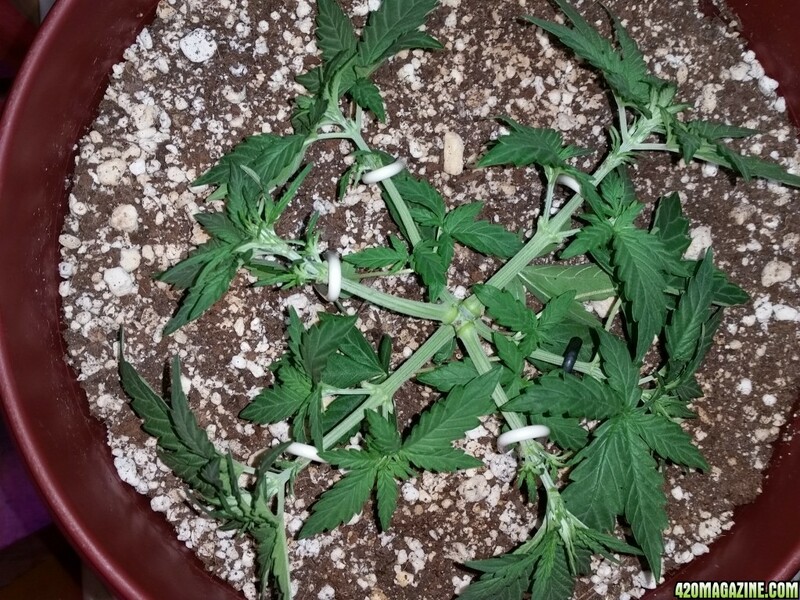 That wraps up the initial topping for Lst'ing later on. Hope that shows you enough that you may experiment this technique on your own. Remember practice makes perfect, you may not get it perfect the first time but the effects on your plant will be the same. 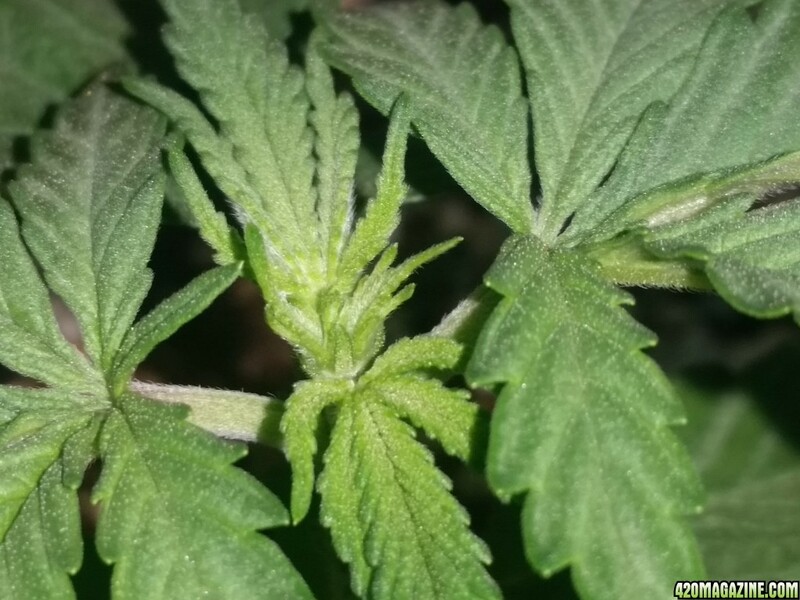 Not too sure about the Jedi M thing though, as early on it seems like a novice might break a fan leaf stem. Those fan leaves draw the light that supports the photosynthesis for the new grow sites you're trying to promote growth in. thank you.those 3 new threads would be nice when complete..
Plant it and grow it...so simple..
Now that we have a little more growth up top and from the secondary shoots we can now begin to train these. 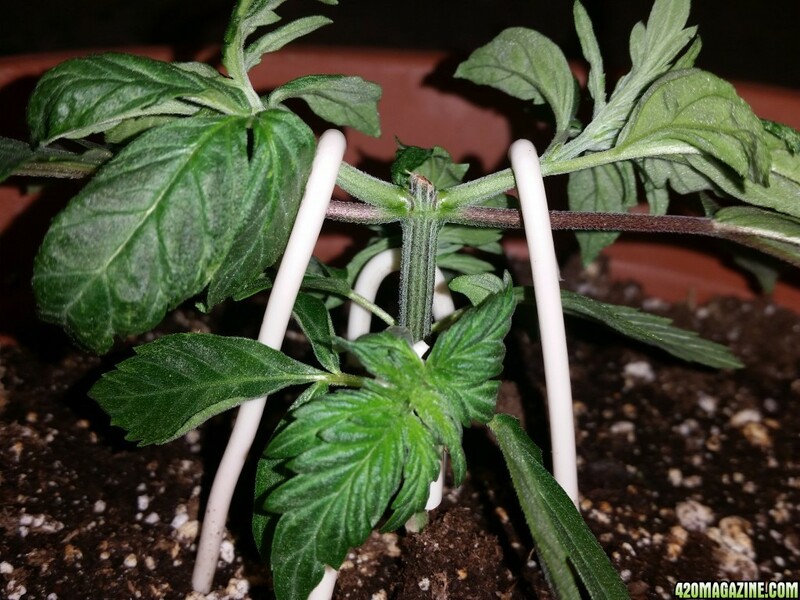 I will be doing a mainline/flux using four growth tips instead of two. I don't know what this is called specifically but I've almost perfected my technique. This is what I'm going for, here's my Leialoha's underbelly from my last grow. This an example of what can be achieved using this technique. 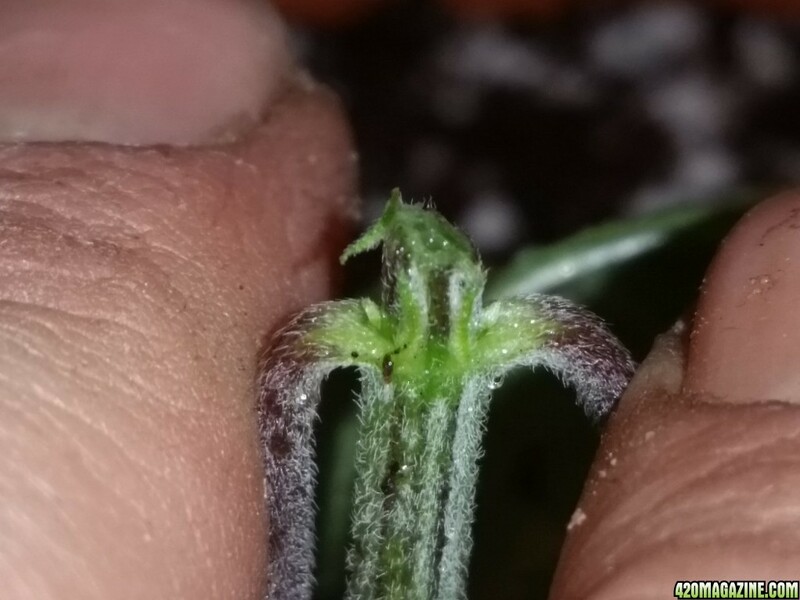 Here we can see the shoots are about an inch long and it now time to bend them down before the internode bulge gets to big and the stems harden. 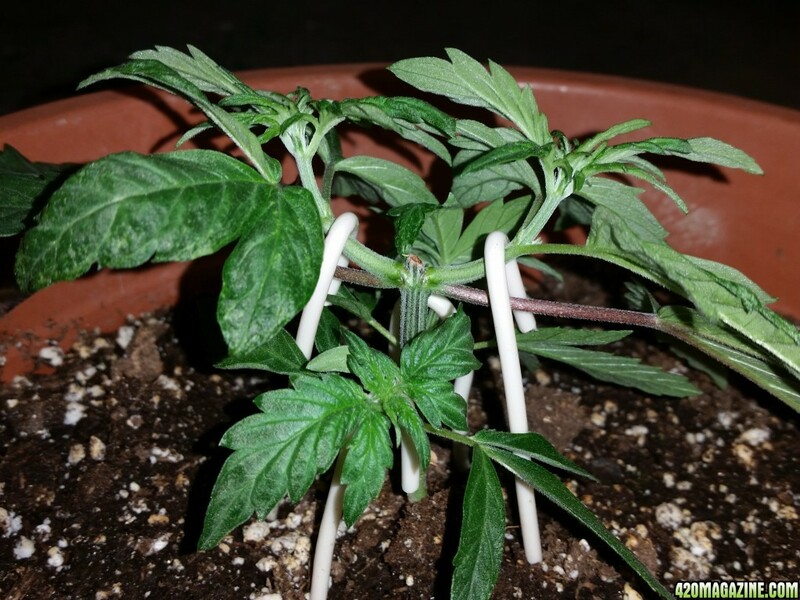 I simply use my coated wire stakes to bend them down to meet the leaf stems. The secondary shoots from the node below will catch up fairly quickly. I've already gave them little nudges downwards to help with training later on. I will be staking these once they reach the upper growth tips. 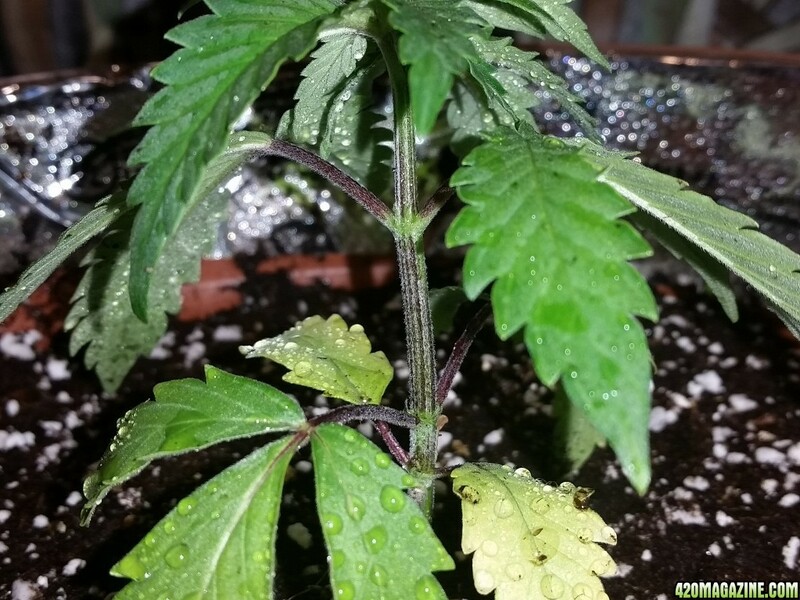 All this will help you create an evenly growing plant from early on in the vegetative cycle. With more and more training to be done this is where we take a break. 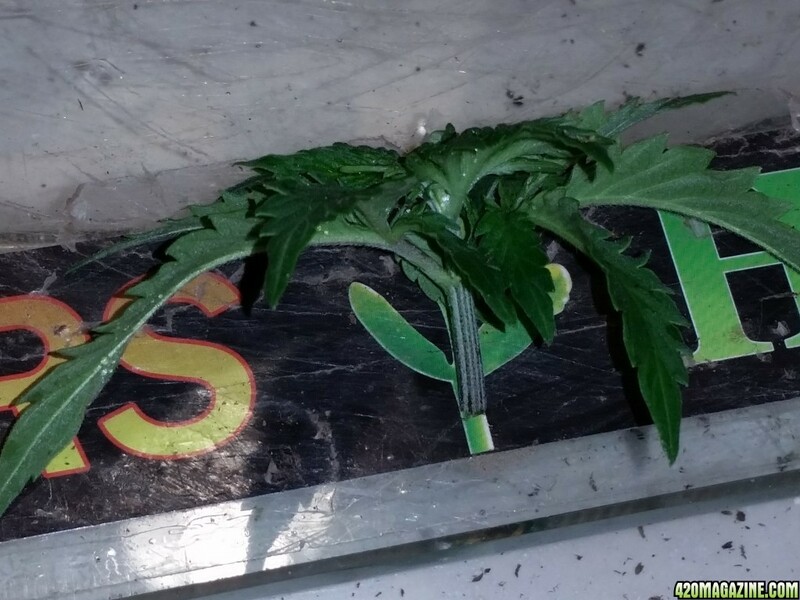 Just a continuation of the previous lesson, the leaf stems are getting bigger now and may need to be removed in the near future to make room for the growth tips to go completly horizontal. 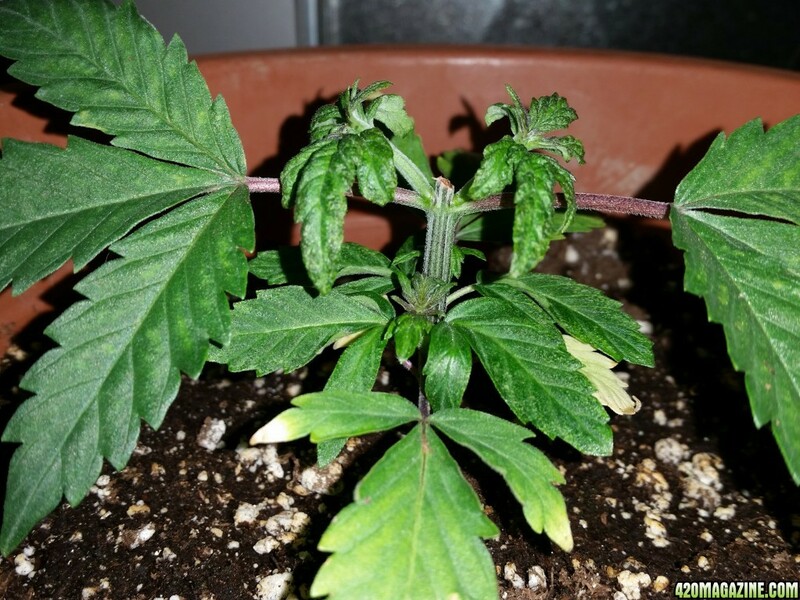 For this plant I will be doing my version of the flux, using four branches instead of two. 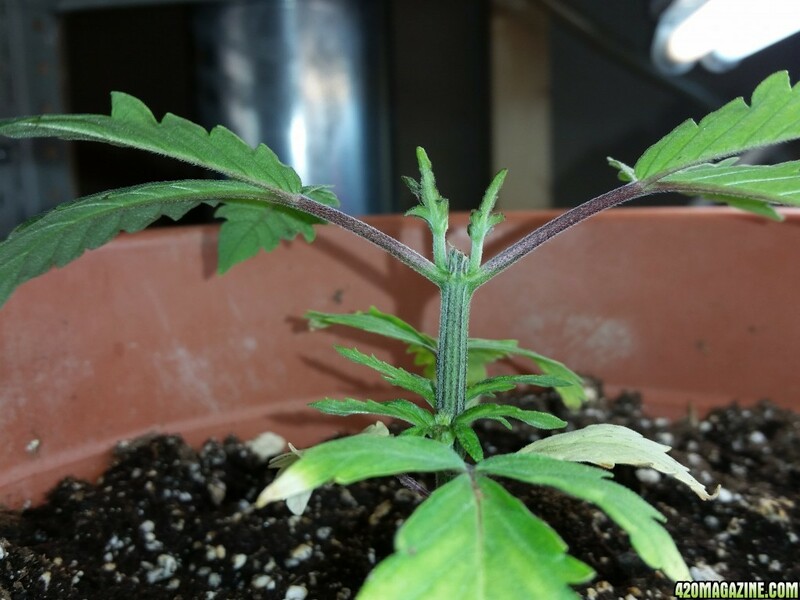 From this point on your own circumstances will dictate which way to LST your plant from here. There are many different ways to go. 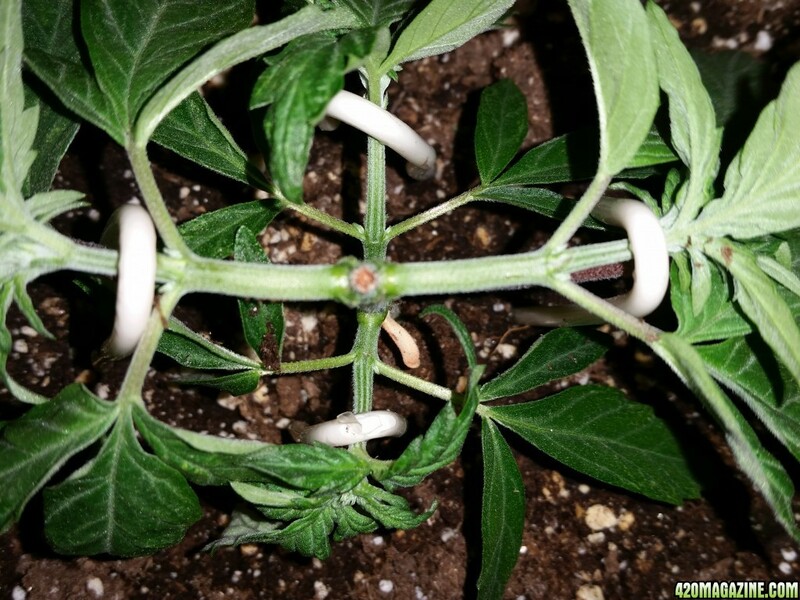 You can mainline, 2 or 4 way flux, let them stretch and top again... Possibilities are endless. 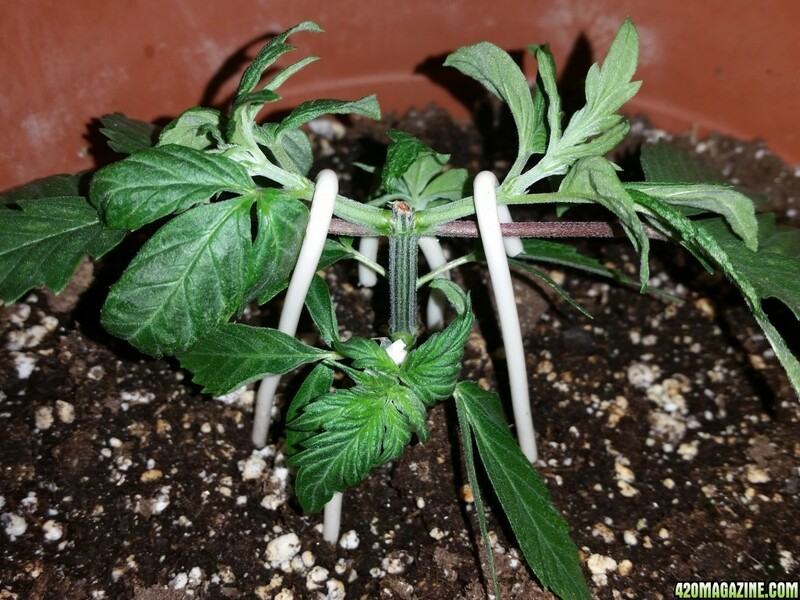 But it all starts with the top two growth tips, they've been staked down more and more as the stem allows me to. You can see the knuckle is starting to form just below the cut. The node below is in full swing now and is quickly catching up to the top tips. I want them to rise up to the same level as the top growth, but I want to elongate the rise to make it even about 5" away from the trunk. I've used more coated 14gauge to pin down the secondary branches to allow for a gradual rise. If I don't do this they will be all caught up within a couple days. 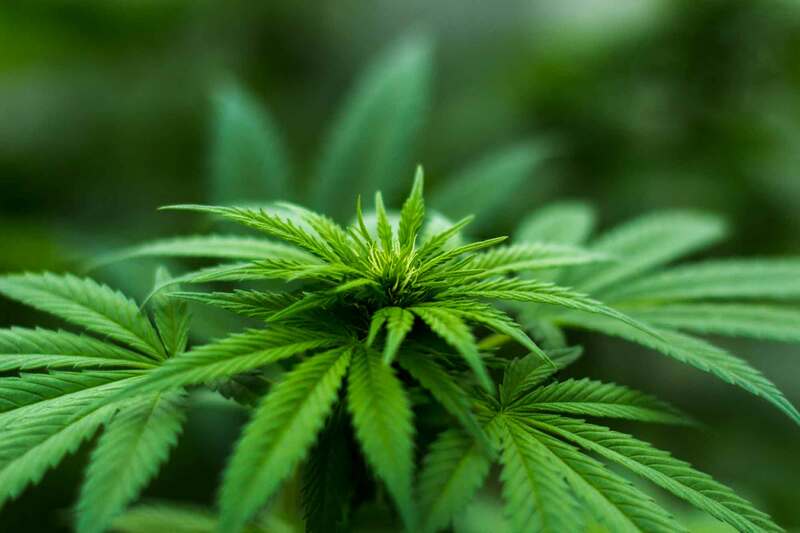 This will give time for the top growth tips to establish themselves and accelerate node production. Now that your new limbs past their first node and are stretching up toward the light, you can direct the back down with ties or stakes. Make sure not to flex any further than horizontal. 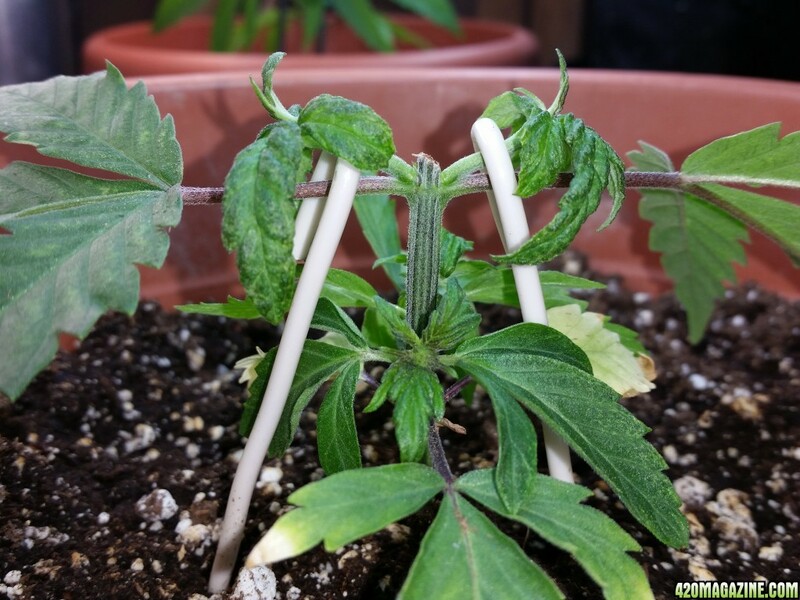 Notice that I've bent them slightly below the first nodes on either side of the main stem. This will encourage some extra energies to creating new growth tips at these locations. Also, now the lower branches have almost caught up to the top growth level. I've let them rise gradually and they have nicely spaced nodes to fill the gap in the mainstems to the first node. Below is a depiction of what is know as tip spreading. 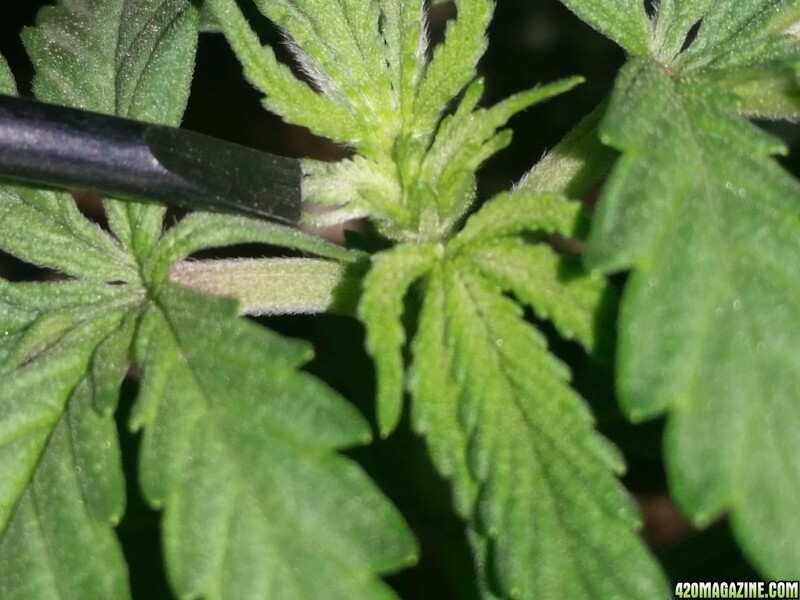 A great 420 member (lightaddict) has a full thread dedicated to this little booster of a technique to create tighter node spacing. 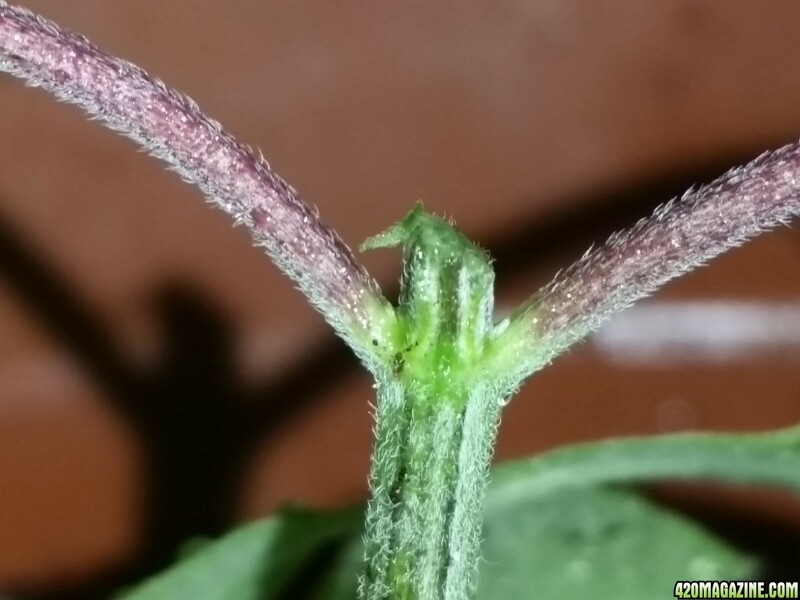 Basically you opening up very immature foliage to expose even more immature foliage within to a light source and therefore signal the plant to begin growing the next batch of immature inner sanctum foliage. That's it for another instalment, hope these are helping folks understand the simplicity of nature and how easy it is to manipulate it in your favour. This is wonderful! Where can I find lightaddict full explanation? There's a great big link to the thread under the last picture in my last post. But if you missed it... Lol. Here you go man, link is below..
LA's really quick guide to tip spreading for node stacking! Hahaha sorry man... I was tired and stoned, just before bedtime. Thanks! 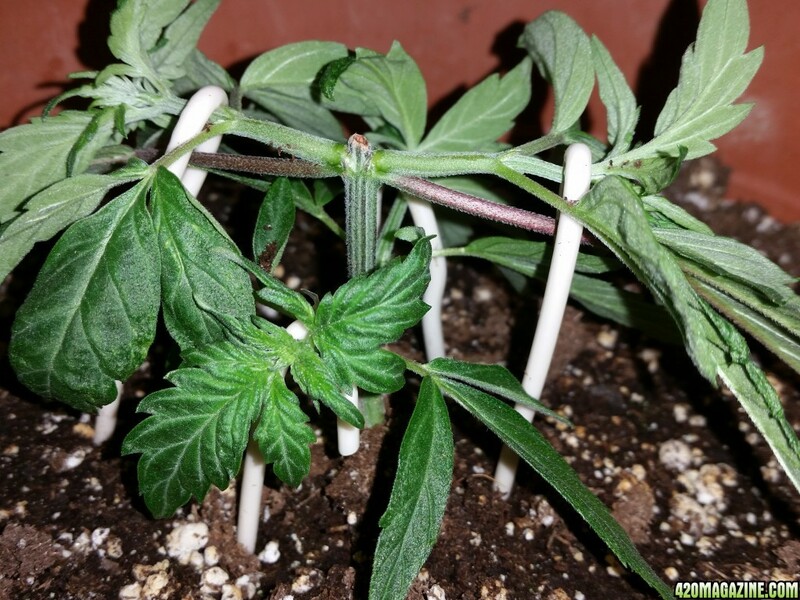 A little example from my garden, these are 21 days old and were topped at day 13. Here we stagger the shoots to grow out equidistant from each other. We have 6 shoots to train outward. Here we cut the bottom leafset and growth tips, making only 4 shoots to train out. 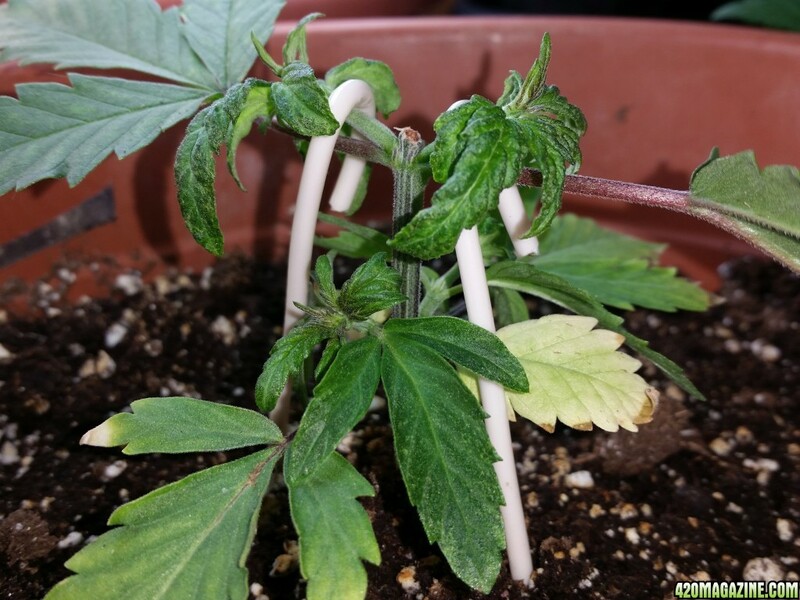 Please feel free to leave some of your own examples, this will be good for new growers to have several examples to look at.